Erysipelas is a skin infection that often follows strep throat. Erysipelas, also called St. Anthony's fire, is caused by infection by Group A Streptococci. This same type of bacteria is responsible for such infections as strep throat, and infections of both surgical and other kinds of wounds in the skin. The infection occurs most often in young infants and the elderly. Erysipelas usually occurs rather abruptly. When the preceding infection was strep throat, the rash begins on the face. Occasionally, when the preceding infection was of a wound from an injury or operation, the rash will appear on an arm or leg. Classically, the usual presentation is a bright-red, butterfly-shaped rash appearing across the bridge of the nose and the cheeks. It is hot to the touch, painful, shiny, and swollen, with clearly defined margins. The edges of the rash are a raised ridge, hard to the touch. There may be fluid-filled bumps scattered along the area. The rash spreads rapidly. Some patients have swelling of the eyelids, sometimes so severe that their eyes swell shut. The patient may have fever, chills, loss of energy, nausea and vomiting, and swollen, tender lymph nodes. In severe cases, walled-off areas of pus (abscesses) may develop beneath the skin. If left untreated, the streptococcal bacteria may begin circulating in the bloodstream (a condition called bacteremia). A patient may then develop an overwhelming, systemic infection called sepsis, with a high risk of death. The rash of erysipelas is very characteristic, raising the practitioner's suspicion towards that diagnosis, especially when coupled with a history of recent strep infection. Attempts to culture (grow) the bacteria from a sample of the rash usually fail. When the bacteria are present in the blood, they may be grown in a laboratory, and identified under a microscope. Other laboratory tests involve reacting fluorescently-tagged antibodies with a sample of the patient's infected tissue. This type of test may be successful in positively identifying the streptococcal bacteria. Penicillin is the drug of choice for treating erysipelas. It can usually be given by mouth, although in severe cases (or in cases of diagnosed bacteremia) it may be given through a needle placed in a vein (intravenously). Even with antibiotic treatment, swelling may continue to spread. Other symptoms, such as fever, pain, and redness, usually decrease rapidly after penicillin is started. Cold packs and pain relievers may help decrease discomfort. Within about five to 10 days, the affected skin may begin drying up and flaking off. With prompt treatment, the prognosis from erysipelas is excellent. Delay of treatment, however, increases the chance for bacteremia and the potential for death from overwhelming sepsis. This is particularly true of people with weakened immune systems (babies, the elderly, and people ill with other diseases, especially Acquired Immunodeficiency Syndrome, or AIDS). Frequently, an individual who has had erysipelas will have it occur again in the same location. Prevention involves appropriate and complete treatment of streptococcal infections, including strep throat and wound infections. Huerter, Christopher, et al. "Helpful Clues to Common Rashes." Patient Care 31, no. 8 (April 30, 1997): 9 +. Bacteremia — The presence of bacteria in the blood. Streptococcus — A bacteria that causes erysipelas and strep throat, as well as other infections. a febrile disease characterized by inflammation and redness of the skin and subcutaneous tissues, and due to Group A hemolytic streptococci; it is a form of cellulitis. The visible symptoms are round or oval patches on the skin that promptly enlarge and spread, becoming swollen, tender, and red. The affected skin is hot to the touch, and, occasionally, the adjacent skin blisters. Headache, vomiting, fever, and sometimes complete prostration can occur. Penicillin is the treatment of choice. Care must be taken to avoid spreading the disease to other areas of the body. Adj., adj erysipel´atous. coast erysipelas a cutaneous manifestation of onchocerciasis seen in Central America, so called because of its resemblance to streptococcal erysipelas. swine erysipelas a contagious and highly fatal disease of pigs, caused by Erysipelothrix rhusiopathiae. (er'i-sip'ĕ-lăs), Do not confuse this word with syphilis. A specific, acute, superficial cutaneous cellulitis caused by β-hemolytic streptococci and characterized by hot, red, edematous, brawny, and sharply defined eruptions; usually accompanied by severe constitutional symptoms. /er·y·sip·e·las/ (er″ĭ-sip´ĭ-lis) a contagious disease of the skin and subcutaneous tissues due to infection with Streptococcus pyogenes, with redness and swelling of affected areas, constitutional symptoms, and sometimes vesicular and bullous lesions. 1. 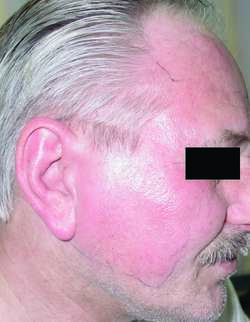 An acute bacterial infection of the skin and superficial lymphatic vessels, caused by streptococci and marked by localized inflammation and fever. Also called Saint Anthony's fire. 2. Infection of pigs, sheep, turkeys, or other animals with the bacterium Erysipelothrix rhusiopathiae, characterized by symptoms such as skin lesions and arthritis in mammals and septicemia in fowl. 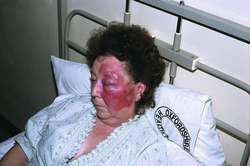 Humans who become infected with the bacterium from handling infected animals or animal products can develop erysipeloid. an infectious skin disease characterized by redness, swelling, vesicles, bullae, fever, pain, and lymphadenopathy. It is caused by a species of group A beta-hemolytic streptococci. Predisposing conditions include diabetes, HIV, and nephrotic syndrome, as well as immunocompromised conditions. It is also seen in those with vagrant life-styles. Treatment includes antibiotics, analgesics, and packs or dressings applied locally to the lesions. A specific, acute, cutaneous inflammatory disease caused by β-hemolytic streptococci and characterized by hot, red, edematous, brawny, and sharply defined eruptions; usually accompanied by severe constitutional symptoms. Oral or IV penicillins or erythromycin, or first-generation cephalosporins, vancomycin, or clindamycin may effectively eradicate the responsible bacteria. Analgesic and antipyretic drugs, such as acetaminophen or ibuprofen, cold packs and topical anesthetics, and elevation of the affected area provide comfort. Standard and barrier precautions are employed. The prognosis is excellent with treatment. Without treatment, the infection may spread, or cause nephritis, abscesses, septicemia and death. Patients and family members are taught to use thorough handwashing before and after touching the affected area to prevent the spread of infection and how to safely clean or dispose of drainage-contaminated articles. The application of cool compresses and elevating the affected parts may reduce discomfort. A form of CELLULITIS from infection of the skin with streptococcal organisms. There are large, raised inflamed areas, high fever and severe illness from toxicity. The lymph nodes in the area are enlarged and tender. Treatment is with antibiotics. A specific, acute, cutaneous inflammatory disease caused by β-hemolytic streptococci and characterized by hot, red, edematous, brawny, and sharply defined eruptions. n an infectious skin disease characterized by redness, swelling, vesicles, bullae, fever, pain, and lymphadenopathy. It is caused by a species of group A β-hemolytic streptococci. n a gram-positive bacterium that does not produce spores and has cell walls. 1. infection with Erysipelothrix rhusiopathiae; occurs rarely in cattle and sheep, principally as an arthritis and laminitis, occasionally as a systemic infection. It is a common and serious infection in pigs and turkeys. In pigs it may be a septicemia with characteristic diamond-shaped skin lesions, or a chronic disease manifested principally as arthritis, sometimes as endocarditis. Turkeys are the only bird species affected at a significant level. In them the disease is manifested as a septicemia with no diagnostic signs. 2. An erythematous-edematous lesion, commonly on the hand, resulting from contact with infected meat, hides or bones; the usual lesion in humans and is called erysipeloid.